Fishbowl Solutions, a consulting services and software development company specializing in solutions for Oracle WebCenter, the Oracle Cloud, Parametric Technology Corporation’s (PTC) Windchill and Creo software products, Google Search, and Mindbreeze Inspire, was announced the winner of the 2017 Modern CX Hackathon announced at Oracle OpenWorld on Monday, October 2nd. The two-day “Hack a Smarter Customer Experience” hackathon event started at 8 AM on Friday, September 29th at the Capgemini Applied Innovation Exchange (AIE) in San Francisco. Teams then had until 8 AM Sunday, October 1st to develop a solution that showcased an Oracle Customer Experience use case from marketing, sales and/or service featuring an Oracle Platform as a Service (PaaS) component that delivered the ability to either connect data, connect consumer experiences, or connect intelligence. The Fishbowl team of Matt Hornung, Andy Weaver, Tom Johnson, Danny Lesage, and John Sim developed an intelligent chatbot solution intended to improve sales productivity, margin, as well as executive insight by allowing 24/7 conversational access to a sales pipeline. This solution is called “SalesBot” – the intelligent chatbot that adds optimization and machine learning to data access. The Fishbowl team leveraged Oracle Engagement Cloud, Big Data Cloud Service, Content and Experience Cloud, and the Oracle Intelligent Chatbot Cloud Service to build SalesBot. Oracle Intelligent Chatbot Cloud Service was used as the framework to build the Intents, Utterances, and Entities mapped to the user conversation. It also provided the integration point for the other Oracle cloud solutions, as well as the Slack collaboration system. Within Slack, users can ask SalesBot questions and request information about customers, service requests, and past work which is returned from Oracle Engagement Cloud. Users can also ask for a pricing quote, which is estimated using the Big Data Cloud Service based on 30,000 pricing records. Lastly, users could request sales presentations or call scripts from SalesBot, and it would return this information from Oracle Content and Experience Cloud. 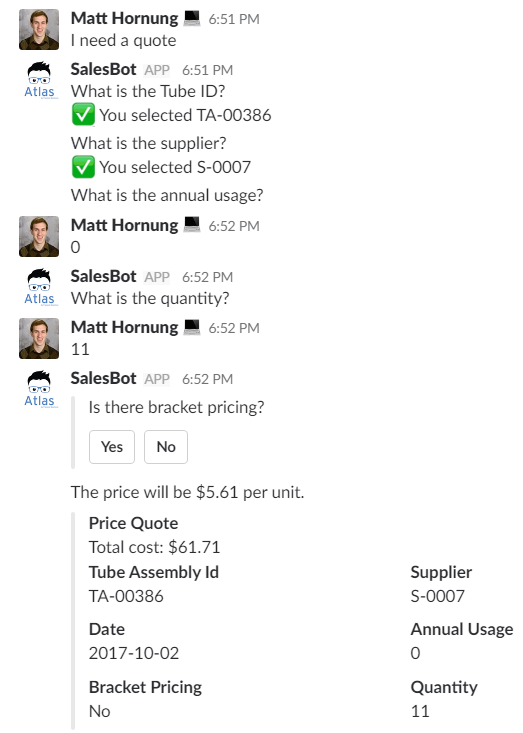 Conversation flow within SalesBot to get a price estimate for a part. Judging took place on Monday, October 3rd. Teams had three minutes present and demonstrate to a panel of some of the industry’s leading customer experience innovators and thought leaders including Ray Wang of Constellation Research, Victor Jimenez of Capgemini, Arturo Litvin of Intel Capital, as well as Des Cahill and Deepak Patil of Oracle. Teams were judged on how well they were able to execute and demonstrate their overall solution with criteria based on 40% for Business Use Case, 40% User Experience Factor, and 20% Technology Implementation. “The CX hackathon gave our team of innovative developers a chance to try out new Oracle Cloud technologies and apply them to a new use case. We had so much fun building a chatbot that runs entirely on the Oracle Cloud and learned a lot together working as team during those 48 hours,” said hackathon project lead and Fishbowl software consultant Matt Hornung.